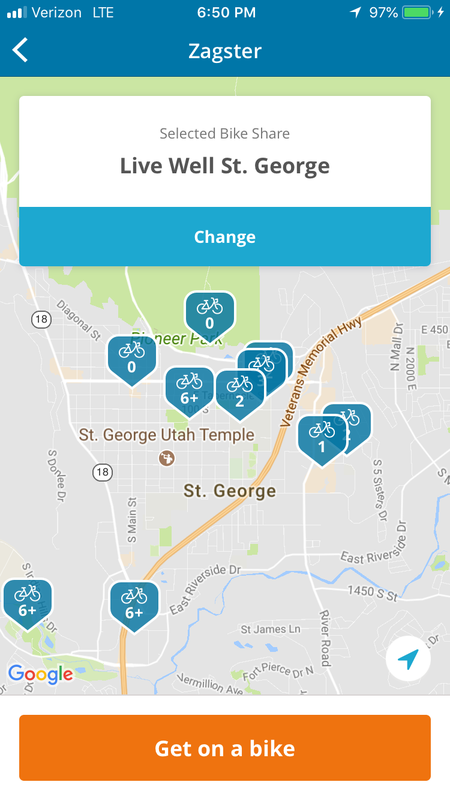 ST. GEORGE – The St. George LiVe Well bike share program has seen more than 1,200 bike rides, which have eliminated over 300 auto trips, according to a city official. “It’s performing well,” Support Services Director Marc Mortensen said. He introduced the bike share program to the St. George City Council last year where it met with unanimous approval. St. George is one of three cities in Utah that host bike share programs. The program is managed by Zagster, which has launched 200 bike share programs across the United States. The city has 10 bike share stations and 55 white, basket-equipped bicycles that have seen regular use. The bike fleet will soon add two tandem bicycles. Individuals can join the bike share program and rent a bike through the Zagster smartphone app. Mayor Jon Pike has called the program a “dream come true” as he hopes to continue promoting St. George as a bicycling community. Last week, the city of St. George released statistics covering the bike share’s first 90 days. From mid-January to mid-March, 787 people signed up for the program and accounted for 1,205 bike trips covering 6,345 miles. Since mid-March, Mortensen said the program has logged an additional 500 rides. The average ride last about 45 minutes and moves along at 8 mph, covering about 6.5 miles. The program is estimated to have eliminated 313 vehicle trips in the city, saving 1,649 vehicle miles and avoiding up to 1,494 pounds of carbon dioxide emissions. Riders using the bike share program are estimated to have burned 396,575 calories. The estimate assumes 500 calories are burned per hour of cycling at a moderate effort. According to the city’s statistics, about 53 percent of the program’s users are women. The majority of the riders also appear to be between 18 and 30 years old. “This could be attributed to fact that nearly everyone in this demographic is well versed and comfortable at using apps found on mobile devices,” the quarterly report states. The most popular bike share stations are at the Town Square on Main Street, the Dixie Convention Center and Dixie State University. 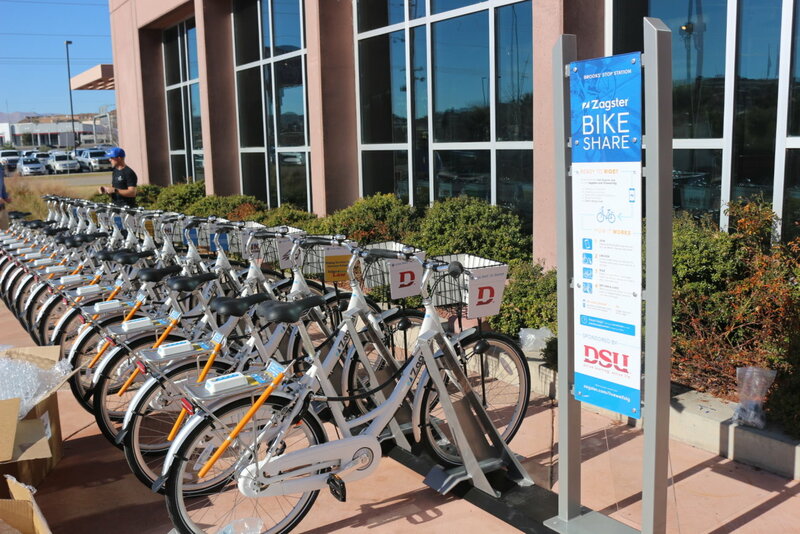 Use of the bike share program may hit a lull during the summer, Mortensen said, but the city expects a major uptick in the fall when students return to Dixie State. An annual bike share membership costs $30, with a student version offered at $15. Those who want to pay as they go can do so for $1 per 30 minutes of use. Between now and May 14, the city is promoting the LiVe Well Bike Share program with a free 30-day membership as a part of National Bike Month. To take advantage of the offer, bike share users will need to access the “bike month” promotion via the Zagster app. Those who sign up for the promotion will get the first hour of every bike ride free for 30 days. Rent a bike here, drop it off there. Come learn about St. George's up and coming bike share program.